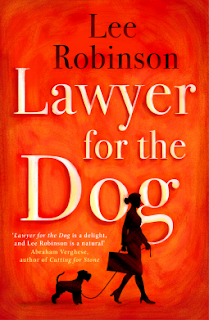 Attorney Sally Baynard is baffled when Joe, her judge ex-husband, appoints her to represent the interests of a pet dog - Sherman, a miniature schnauzer - in a divorce case. As Sally begins to investigate, she discovers the battle for Sherman masks a whole host of problems between Rusty and Maryann Hart. The more she discovers, the more Sally starts to realise the dog is the least of their worries. But is Joe's request all that it appears? And as Sally delves deeper into the family's love of their canine best friend, might Sherman prove to have a nose for love? 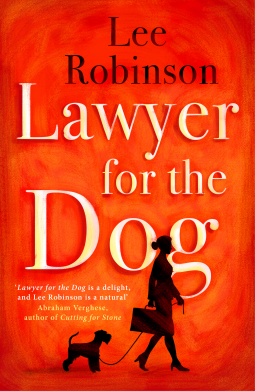 Lawyer for the Dog is Lee Robinson's charming, moving and funny debut novel. I admit it was the combination of intriguing title and the cleverly silhouetted figures against a backdrop of rich red hues on it's cover that initially drew me to this book. Whilst the saying goes that you shouldn't judge a book by it's cover this book didn't disappoint. I loved this book which was warm & witty and like a breath of fresh air. Packed full of family and relationship drama this is far from a typical novel about a female lawyer. For a start she is middle-aged but sassy, caring and still attractive if only a little out of the dating game, but atypically not because she is tied to her desk. Sherman is adorable but who would have thought that such a small dog could make such a difference to her life. Enter the handsome vet who rivals Joe for Sally's affections. But there is a deeper side to this story too as the relationship with her ex and ageing mother are explored. In contrast to other page turners where I can hardly wait the outcome and the inevitable end this was a relaxing read, which left me with a smile on my face and the taste for more. The book is well written with a quirky plot, interesting dialog and flowing text. The characters are so well fleshed out each with their own distinct characteristics that they feel real. I was satisfied but sorry when it ended. With plenty of story and a sprinkling of romance I liked that it touched on life's deeper issues in the context of caring like divorce, age related dementia and even cancer. Like most popular women's fiction the underlying theme of this book is about coming to terms with life's current issues and making new beginnings. Bookfan: "I loved being in Sally’s head while she navigated through her days. It was difficult not to laugh much of the time."